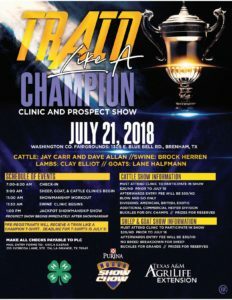 Join us at the Train Like A Champion Purina Show Clinic and Prospect Show in Brenham, TX on Saturday, July 21st. The event will take place at the Washington County Fairgrounds, 1305 E Blue Bell Rd #110, Brenham, TX 77833, and check-in will be from 7 AM until 8:30 AM. Some of the events throughout the day include a sheep, goat, and cattle clinic as well as a swine clinic. There will be multiple specialists available at the event to help you with your show animals. Let us know if you have any questions about the event. We are looking forward to seeing you there! This entry was posted on Friday, July 13th, 2018 at 6:00 pm	and is filed under Events, News & Updates. You can follow any responses to this entry through the RSS 2.0 feed. Both comments and pings are currently closed.